Completed the Western Arctic Main Hunts and first Fishing Contest on Greenhorn Difficulty. Completed the Western Arctic Main Hunts and first Fishing Contest on Sportsman Difficulty. Completed the Western Arctic Main Hunts and first Fishing Contest on Simulation Difficulty. Completed the Interior Alaska Main Hunts and first Fishing Contest on Greenhorn Difficulty. Completed the Interior Alaska Main Hunts and first Fishing Contest on Sportsman Difficulty. Completed the Interior Alaska Main Hunts and first Fishing Contest on Simulation Difficulty. Completed the South Central Alaska Main Hunts and first Fishing Contest on Greenhorn Difficulty. Completed the South Central Alaska Main Hunts and first Fishing Contest on Sportsman Difficulty. Completed the South Central Alaska Main Hunts and first Fishing Contest on Simulation Difficulty. Completed the Southeastern Alaska Main Hunts and first Fishing Contest on Greenhorn Difficulty. Completed the Southeastern Alaska Main Hunts and first Fishing Contest on Sportsman Difficulty. Completed the Southeastern Alaska Main Hunts and first Fishing Contest on Simulation Difficulty. Completed all missions and contests in the Western Arctic on Sportsman or Simulation Difficulty. Completed all missions and contests in Interior Alaska on Sportsman or Simulation Difficulty. Completed all missions and contests in South Central Alaska on Sportsman or Simulation Difficulty. Completed all missions and contests in Southeastern Alaska on Sportsman or Simulation Difficulty. Three Male Bear Trophy Legends have been shot and claimed in any difficulty level in Adventure Mode. At least 10 different animals have been shot and claimed, with a bow, in Open Season. At least 10 different animals have been shot and claimed, with a shotgun, in Open Season. At least 10 different animals have been shot and claimed, with a rifle, in Open Season. At least 10 different animals have been shot and claimed, with a handgun, in Open Season. A Black Bear has been shot and claimed in any difficulty level in Adventure mode. A Kodiak Bear has been shot and claimed in any difficulty level in Adventure mode. A Grizzly Bear has been shot and claimed in any difficulty level in Adventure mode. A Polar Bear has been shot and claimed in any difficulty level in Adventure mode. A Sitka Black-tailed Deer has been shot and claimed in any difficulty level in Adventure mode. 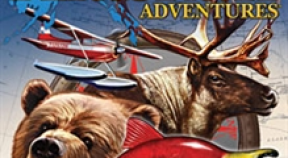 A Yukon Moose has been shot and claimed in any difficulty level in Adventure mode. A Roosevelt Elk has been shot and claimed in any difficulty level in Adventure mode. A Caribou has been shot and claimed in any difficulty level in Adventure mode. A Dall's Sheep has been shot and claimed in any difficulty level in Adventure mode. A Stone Sheep has been shot and claimed in any difficulty level in Adventure mode. A Grey Wolf has been shot and claimed in any difficulty level in Adventure mode. An Arctic Wolf has been shot and claimed in any difficulty level in Adventure mode. A Mountain Goat has been shot and claimed in any difficulty level in Adventure mode. A Musk Ox has been shot and claimed in any difficulty level in Adventure mode. A Bison has been shot and claimed in any difficulty level in Adventure mode. Player caught an Arctic Char in any difficulty level in Adventure mode. Player caught a Northern Pike in any difficulty level in Adventure mode. Player caught a Silver Salmon in any difficulty level in Adventure mode. Player caught a Dolly Varden in any difficulty level in Adventure mode. Player caught a Lake Trout in any difficulty level in Adventure mode. Player caught a Sockeye Salmon in any difficulty level in Adventure mode. Player caught a King Salmon in any difficulty level in Adventure mode. Player caught a Rainbow Trout in any difficulty level in Adventure mode. Player caught an Arctic Grayling in any difficulty level in Adventure mode. Player caught a Cutthroat Trout in any difficulty level in Adventure mode.